A day of active learning on Design, Entrepreneurship & Inspiration. Don’t miss it! Only four seats remain for this one day affair in Chicago. 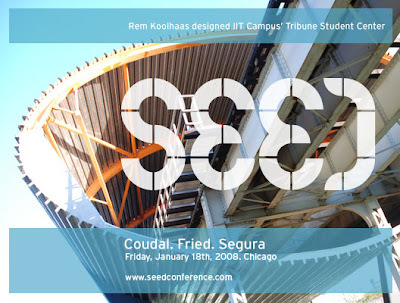 Coudal Partners, 37signals & Segura Inc.
And I’ll be there, talking about our surroundings in the Rem Koolhaas – designed Student Center at IIT – that’s the inspiring place in which the conference takes place. It’s on the Illinois Institute of Technology campus (with Crown Hall!) designed by Mies van der Rohe, so I guess I’ll get to talk about him a little bit too. Sign up here. And big kudos to Jason Fried and Carlos Segura of 37signals, Wired magazine just named it one of the top ten startups worth watching in 2008. They were lauded for their “simple and accessible” computer programs. Bravo! You are currently browsing the archives for the Wired category.